We are very grateful to Kristine Pedersen from Kommunikationscentret in Denmark for sharing the findings of 2 projects with us. The first project found Talking Mats was effective in supporting communication for people who have dementia when compared with both unstructured and structured conversations. At Kommunikationscentret in Hillerød (Denmark), we have been using the Talking Mats framework since our first trainer was accredited at the Talking Mats Centre, University of Stirling in 2010. 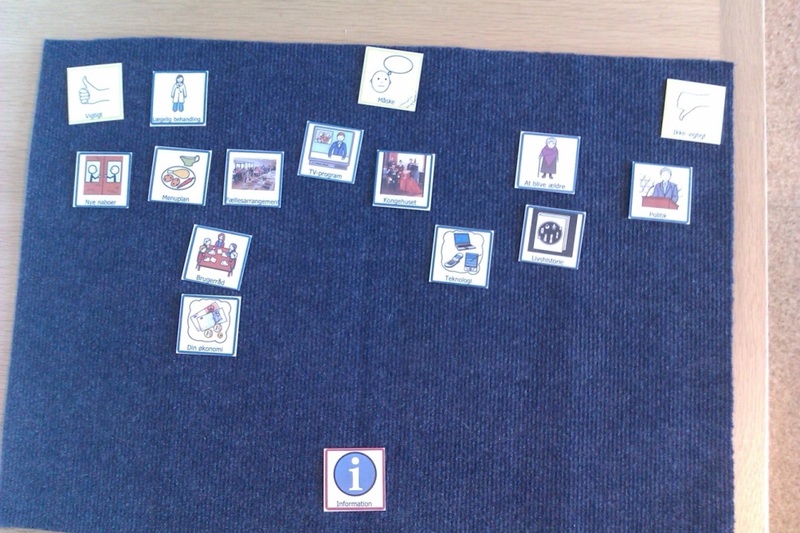 We have been using Talking Mats with both children and adults across a range of communication difficulties e.g. caused by Aphasia, Cerebral Palsy, Downs Syndrome, learning difficulties etc. Inspired by the important research project by Dr. Joan Murphy and others ‘Decision making with people with dementia’ (2010), our next step was to gain our own experience within the framework specifically aimed towards people with dementia. As in the rest of the world, the number of people in Denmark with dementia is increasing. Symptoms of dementia vary from person to person but many of the symptoms are related to communication: Difficulties finding words, using familiar words repeatedly, losing track in conversation, difficulties in focusing and paying attention etc. The growing dependence of the person with dementia on a caregiver makes communication essential to express wishes and needs. Therefore, it makes sense to look at the consequences of the illness (dementia) within the perspective of communication and how family members and professionals around the person with dementia can support communication using AAC. The purpose of the first project was to compare the communication in conversations about views on I) Daily activities and II) The importance of information, using three different communication methods. The methods were: 1) unstructured conversation 2) structured conversation 3) the Talking Mats framework. The project involved 6 participants having early to moderate stage dementia, all living in residential care homes. Like the study ‘Decision making with people with dementia’ (2010), the report concludes that the Talking Mats method was associated with better communication for the majority of the participants. 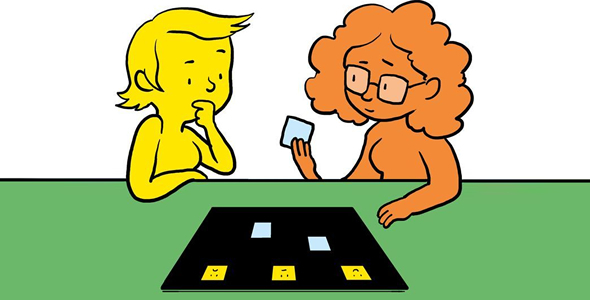 The Talking Mats framework was found especially helpful regarding the participant’s ability to understand subject and question of the conversation, the participant’s ability to reflect, and the participant’s ability to make themselves understood. 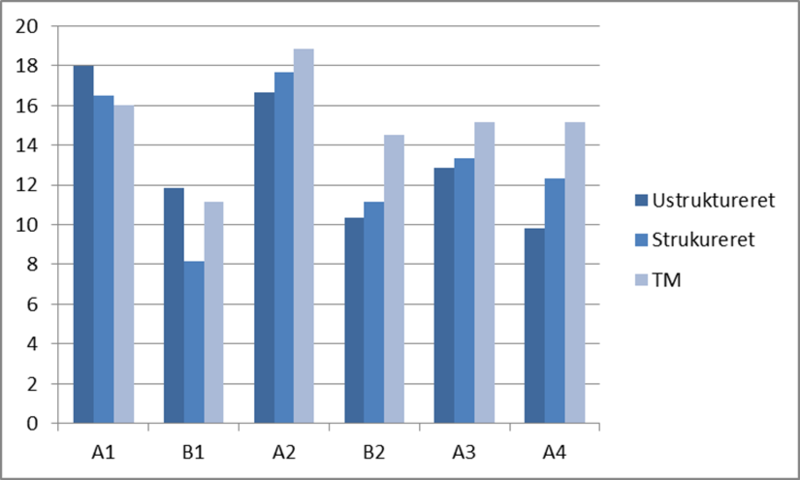 The graph below shows that only one participant (A1) did not benefit from the visual method. She had poor eyesight, which strongly indicates that visual support compensates the difficulties that people with dementia have. The report also concludes that the Talking Mats framework increases the interviewer’s ability to detect and compensate for some of the communication difficulties. Finally, it seemed that several of the participants have been able to learn how to use Talking Mats in the process. The photo underneath shows a Talking Mat conversation from the project. This Talking Mat gives an insight into how this person feels about what information is important to her, and what isn’t. It is in some way a difficult and abstract question, but most of the participants managed to both understand, reflect and answer the question when we used the Talking Mats framework. Important information to this participant is information about new neighbours, the menu at the residential care home, economy etc. Less important is news about the Danish royal family, technology, getting older etc. Politics is definitely not important to her. This entry was posted in AAC, Blog, Dementia, Participation and tagged AAC, Dementia, Participation, Talking Mats on January 28, 2016 by Rhona Matthews. We are very grateful to Tom Tutton from Autism Spectrum Australia for this interesting blog. Autism Spectrum Australia (Aspect) works with people on the autism spectrum and their families. We regularly recommend visual communication strategies because people on the spectrum often have strengths in visual learning. This is especially important in our work through Aspect Positive Behaviour Support where communication can replace challenging behaviour. 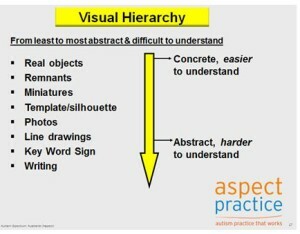 In the past, we applied a ‘hierarchy’ of visual representations based on how easily they can be understood. Generally, objects are considered the easiest form of visual communication to understand; followed by miniatures, remnants, photos, line drawings and symbols and writing, in that order. Although this hierarchical understanding is held true for many people on the spectrum, there can be exceptions. Some individuals find line drawings easier to understand than photographs. This entry was posted in Blog, Communication difficulties, symbols and tagged Communication difficulties, symbols on January 22, 2016 by Joan Murphy.